If you want a guide who loves the environment - birds, plants, bees, wildlife and the astounding Iguaçu Falls then Marcelo is your man. We had a very busy day, we viewed the Falls from both the Brazilian and Argentine side, both sides are spectacular. Marcelo's tour is not for the feint hearted, we walked 11.9 kilometres which equates to more than 16,000 steps! Lunch was on the run, we bought a sandwich and just kept going. We had a great day, heaps of info delivered with passion! Thumbs up Marcelo! Marcelo was the perfect guide. Friendly polite and helpful. He arrived to pick us up on time and gave us a brilliant day out at Iguazu Falls. He ensured we got good views of the Falls. Right from when we booked this tour a year ago, Marcelo kept in touch and answered my questions and he then let me know a week before that everything was fine. Marcelo was very knowledgeable about everything from nature, fauna, animals of all sizes and habitats, the falls, Brazil and Argentina. He gave great tips on how best to avoid the crowds to get the best photos. Only short fall was he was unable to stop the the rainy weather on our tour day. Marcelo is a nature lover, very knowledgeable, open minded and attended perfectly to make it a wonderful trip. Marcelo nos ayudó a cumplir con nuestra meta de ver las cataratas desde ambos lados de la frontera. Fue muy activo y dinámico y completamos todas las actividades que queríamos hacer, incluido el paseo en bote. Fue un placer conversar e intercambiar con él. ¡Su nivel de competencia en varios idiomas es impresionante! We really enjoyed our tour of the Brazil and Argentina sides of the falls with Marcelo. He provided interesting commentary and pointed our flora and fauna on the paths. Marcelo is a terrific guide! He is very knowledgeable about the flora and fauna as well as the geography of Iguazu and the surrounding area. We loved the tour. 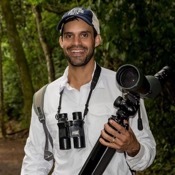 If you are a bird watcher you must go with Marcelo!! Marcelo is a great guide! He was very attentive and knowledgable about the local flora and fauna. He has eagle eyes, if you are a birder you definitely want him as your guide. He picked me up in Brazil then my parents in Argentina then we went back to Brazil to see the falls all with a smile on his face. We would definitely use his services again. TOUR GUIDE RESPONSE: Dear Tyne Mester, You are a highly experienced traveler, independent and a great photographer. I was actually luck by committing a mistake when I took you straight to the brazilian side after the airport pickup with your parents and instead of go back you decided to continue the tour. The end of the history you know better than me. I wish you and your parents a great life. Thank you to have come, for your patience, to have chosen me as your host in Iguazu & thank you for the inspiration that you brought. Marcelo was excellent! My friends and I would highly recommend his tour. He spotted plants, animals, insects etc and pointed everything out to us. He is very knowledgeable about birds especially. We felt the cost was very reasonable and we got more out of seeing the falls than we would have if we had done it on our own. Marcelo was awesome. We did three full tours with him: both sides of the falls and the Jesuit ruins. He was incredible and super accommodating, especially for a family with 2 young daughters. We crossed the border multiple times with ease. Great english and very knowledgeable. Highly recommend. Marcelo est un guide fantastique. Il est venu nous chercher à l'aéroport et nous avons passé toute la journée avec lui. Il connait très bien la région ainsi que la faune et la flore locale. Vous pouvez partir avec lui les yeux fermés! Marcelo was one of the best tour guides I've ever had. He was extremely knowledgeable of the local area, the fauna and floral and was just generally professional in every way. I would highly recommend him to anyone I had an amazing day in Iguazu Falls with Marcelo. Marcelo was an amazing guide! He was on time picking us up in the Argentinian airport (Cataratas) and did a great job touring us on the beautiful Argentine side of the falls. He was very interactive and described the local flora/fauna and let us enjoy the falls on our pace. He dropped us off at our hotel later in the day, and then picked us up the next day on time, touring the Brazilian side. Overall, he was a great guide and we are very happy with his service! Can't recommend him enough! Thanks Marcelo!! Marcelo did a great job in providing a walking tour of the Iguazu Falls. We did the train to the Devil's Throat and the lower circuit. He was knowledgeable in the falls, the foliage, and the wildlife (insects) in the area. He added needed commentary when doing the walking tour. In addition, we drove to the intersection of Paraguay, Brazil, and Argentina and a quick tour or Iguazu (nothing there). I would recommend Marcelo for better appreciation of the Falls and the area. Marcelo was outstanding. We had limited time and some complex logistics but he handled the tour, the border crossing and pickup/drop off very smoothly. Moreover, his narrative was excellent. Not only about the Falls but also about Brazil generally.. the history, culture, diversity etc. He is a very interesting and interested professional and also helped by providing some great contacts in other cities which we used. Marcelo was a great guide. His knowledge of history, plants and animals made the day in the park most enjoyable. His English skills are amazing and he is very considerate of what the client wishes to see and do. He was on time. Very pleasant and affable. Terrific guide. One of our best guides ever. He made the Iguazu experience memorable. Outstanding guide. Pleasant, and very knowledgeable. Marcelo gave us an excellent tour of the Argentinian side of the falls. He was very knowledgeable about the the local plants, birds, wildlife, and insects so it was a treat when he would point out things we never would have noticed. He was very accommodating of our slow pace, and the car he used for transport was very comfortable and had air conditioning. Very friendly and spoke excellent English. We highly recommend Marcelo. Great tour! Marcelo knows the park so well that always found us a short cut or little tips to make our tour a lot easier. And his knowledge on animals, trees, plants are excellent! We learn so much from him as well as seeing this amazing falls. I would highly recommend anyone to join this tour if you want to truly enjoy the National Park. This tour truely exceed our expectation! Excellent tour, expert navigation and were never rush during the tour. We were picked up at the airport and went directly to the park, Marcelo was very knowledgeable with the park and know exactly what to do. Highly recommended! One would be well served to engage the professional guide services of Marcelo while visiting Iguazu Falls and area . He is a very knowledgeable individual who will enhance your visit with information not only on the Falls but life in general in Brazil. A thank you to Marcelo for a most enjoyable tour especially for suggesting an early morning start to avoide the crowds. No hesitation in recommending Marcelo to our fellow visitors. Wayne J Grady. Marcelo was very knowledgeable. Speaks 5 languages. Is especially strong with flora and fauna. Went at the pace we chose. Most importantly got us to the front of lines and saved us hours of waiting. Cannot say enough good things about him. TOUR GUIDE RESPONSE: Thank you Elaine Paveley. We spent a few days with Marcelo, had a great time and would thoroughly recommend him due to his knowledge and enthusiasm for the local area and the natural environment. We visited both sides of the Falls, taking us to the best viewing points whilst accommodating a knee injury. He picked up and dropped off at both local airports, also assisting us at the border crossing and our hotels. Thank you Marcelo for an enjoyable couple of days. Excellent Tour, Marcelo is very knowledgeable of the Falls and was a great Guide. Marcelo took over our tour of „Both sides of the falls" at short notice from another guide who had to cancel due to illness. Thanks to everyone involved for making this day possible! Marcelo picked us up at the airport, saving us time by handling all border and other formalities, perfectly organising our day while expertly explaining flora, fauna and whatever else there is to know and see, always giving us enough time to marvel at the sights, even providing us with drinking water. Absolutely perfect! I would highly recommend our guide, Marcelo! He met us at our hotel on time, drove us to the falls, arranged all of the tickets, tolls, and fees which made for a hassle-free day. Marcelo is an interesting, kind and open person. He speaks several languages is an expert in flora and fauna in the area. Thank you, Marcelo, for your sharing your story with us you are amazing! To top it off, we had booked to see both sides of the falls in one day but could not get a visa in time, he gave us a partial refund!!! Marcelo is the best tour guide that we had. He was very knowledgeable about the area, very professional, on time and curious. We recommend him to any one that wants to visit Iguazu Falls. Marcelo was very knowledgeable, professional and Curtious. He gave the best experience and best representative for tours by local. We really enjoyed the tour and recommend him 100 percent. We LOVED Marcelo. He is highly informative and professional. I would highly recommend him as the tour guide because of his wealth of knowledge and communication skills. I would give him 10 out of 5 if I could! He truly made my trip with my sister to Iguazu Falls incredibly memorable and educational. He was super detailed in his organization, efficient in his planning and super responsive to the shifts in our schedule. His knowledge of the land, local botany, culture and history of the environment made our visit extra insightful. We were able to skip long lines and get the best photo opps because of his experience. I would highly recommend this tour to everyone. TOUR GUIDE RESPONSE: Dear Magdalena Noway, you are an excellent walker, fine, very well educated and sensible to nature. Thank you very much to have come and choose me as your tour guide. Your good memories about Iguazu Falls are my happiness. Thank you very much. Marcelo. Marcelo was an excellent guide. He was efficient, punctual, always had our interest at heart. He went the extra mile in ensuring that he gave us as much information as possible and planned the excursion with precision. He is not only passionate about what he does but is motivated by serving his guests in the best possible way. We only had a day to visit Iguazu Falls recently and couldn't have asked for a more informed and friendly guide who really knew the area well plus knowledge of the flora &fauna. l got bumped off our 6am flight so arrived 3hours later than planned- but it didn't phase Marcelo a bit. Messaged back and forth at 5.30am - no worries. Marcelo collected us in v comfy car drove to the park and got us off to a great start. We walked 12km all up with him and saw every single accessible part of the Falls. Amazing! An excellent, very informative and helpful guide. Excellent English. Was punctual, gave us full tour of Brazilian falls, helped with border formalities, and took us to our hotel in Argentina. Also gave us advice on visiting Argentinian falls, which we did the next day on our own. Provided iced water when temperature was 38 degrees. Cannot fault him, would recommend him to anyone else. This is a somewhat belated review'. Our tour was in January 2017; we had the opportunity of 1 day at Iguasu and Marcelo helped us make the most of every moment. We saw wildlife; we had close up exposure to all the key points of the falls and a great day. Also a safe and comfortable car. Several months on, we continue to reflect on the quality of the experience, thanks to Marcelo. Excellent guide, very informative and accommodating of delays due to cruise line late arrival/customs delays and subsequent change of flights to Iguacu. Marcelo is everything one would want in a guide. He is very knowledgeable and knows the Park very well. His energy and exuberance is fantastic. His intellectual curiosity is unmatched giving him a vast bank of knowledge which he eagerly shared. He guided us through the entire Park on a very busy Sunday with complete finesse. What a pleasure to spend the day with and we highly recommend him. Marcelo led us on a tour of the Brazilian side of Igauzu Falls as well as transported us to the Sheraton on the Argentinian side. He was very knowledgeable of the plants and animals in the park. Overall, booking with Marcelo made great use of our limited time and allowed us to see all we came to see and more. Marcelo was amazing! We arranged tours to Paraguay (very eye opening! ), as well as the Brazilian Falls and Bird Park. He also picked us up from the airport, and arranged a transfer back to the airport. He is extremely intelligent and knowledgeable, and truly an amazing human being. We cannot recommend him highly enough! Marcelo is an AMAZING tour guide. 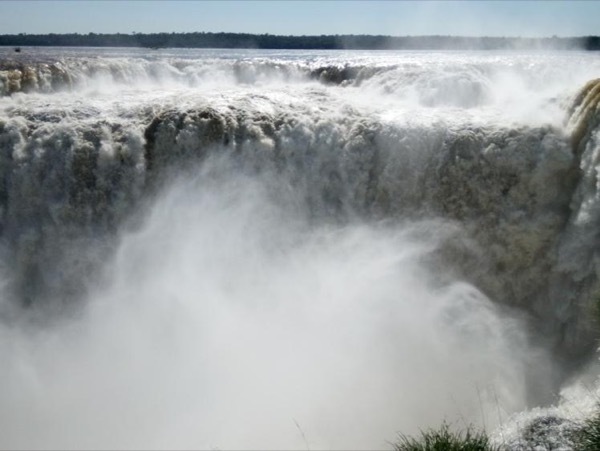 His knowledge of the Iguazu Falls and surrounding area is extensive. His passion for the natural environment is obvious and he does an excellent job of sharing his knowledge. He was always punctual, organised and an excellent communicator. Marcelo was very patient with our 2 year old son and the varying pace in which he allowed us to travel. His English is excellent and he has a wonderful sense of humour. We can't recommend him enough! TOUR GUIDE RESPONSE: Dear Heidi OBryan, I am very happy to be able to have done this special transfer for you and family. Thank you very much. TOUR GUIDE RESPONSE: Thank you very much Heidi OBryan. Great tour! Marcelo is fantastic, he tells a lot about fauna and flora beside the falls. Everything is well organised from him and we felt safe and comfortable the whole day. All the best for you, Marcelo! TOUR GUIDE RESPONSE: This day we definitely had a so short time to really enjoy Paraguay, anyway thank you for this visit too. TOUR GUIDE RESPONSE: Thank you for everything! Iguassu Falls is one of the world's greatest shows, and Marcelo does an incredible job in showing it from both the Brazil and Argentina perspectives. He is a wonderful guide and person as well. TOUR GUIDE RESPONSE: So Heracilio, Rodrigo and Connie I had a great experience with you and for sure I learned much more than I taught. Marcelo was the perfect guide to show us the sights of Iguazu Falls. We saw both sides of the falls and he was knowledgeable of the area and wildlife. Thank you Marcelo for a great day!! TOUR GUIDE RESPONSE: Patricia had a wonderfull day with you! TOUR GUIDE RESPONSE: Since the transfer from the airport I was feeling that I had very nice days beyond with you all. This is the first holiday where we have booked private guides just for us, as compared to private group tours. Although private guides are expensive, you get what you pay for. In this instance we had a brilliant day with Marcelo that we could never have achieved if we'd tried to do it on our own. Marcelo's spotless car, his perfect English, his well planned itinerary, the border crossings and his drop off at the airport were perfect. We recommend Tours By Locals and Marcelo D to anyone visiting Iguazu. Marcelo was simply awesome - We did the "Iguazu Best Package" and everything went perfectly. All of his recommendations were spot on and he was excellent at the naturalist elements of the trip in addition to general guiding to the various falls venues. Marcelo is a fantastic tour guide. He is very knowledgeable about the flora and fauna of the area and was very informative regarding the history and conditions of the area. His English language skills are impeccable and personality wise very enjoyable to talk with while on our tours. I would highly recommend Marcelo to other travelers visiting the Iguazu area. Marcelo is an excellent guide. Marcelo is an excellent guide who looked after us very well. His knowledge was amazing and this really made such a difference to our experience. Having such a competent person organising our day meant we could relax and enjoy the day fully. He was also able to give us additional information for other activities which enhanced our whole stay in Foz do Iguazu. I would have no hesitation in recommending his services. Thank you Marcelo, you were marvellous. Marcelo was a very helpful guide and a pleasure to be with during our amazing visit to the Falls. He is very accommodating to your needs and very flexible with the itinerary. He provided good suggestions for food in the area. He is a very knowledgeable, personable and accommodating guide. I would recommend him to anyone who wants to hire a private guide to the Falls. Marcelo was one of the best guides if not the best we have ever had on any tour we have done. He was totally professional with perfect English and was very educated on the tour he took us on (Iguazu falls both sides in a day). I wouldn't hesitate to use Marcelo again given the chance. Marcelo was punctual, he understood our needs and kept the tour interesting throughout. We spent an enjoyable day together and we recommend him without hesitation. We were very fortunate to have had 2 excellent guides from your company on this trip. First, Fabian in Buenos Aries and now 2 days with Marcelo in iguazu falls. If Marcelo was not a guide, he would probably be a university professor. His command of his subject field was over the top. His knowledge of the environment, the plants and animals, and the history of the area was fascinating. We were very lucky to have this young man. The 4 teachers on this tour are putting him at the top of the class. Couldn't be happier! Marcelo is a superb guide! He collected us at the airport for our one day whirlwind visit to Iguazu Falls from Buenos Aires. A very personally tailored tour included a hugely successful bird walk (w/ lots of plant identification/information too) followed by a visit to all 3 routes of the falls from Argentina. Lots of walking by choice and he was attentive, unobtrusively helpful and endlessly informative answering questions and volunteering information. Totally recommend him!!! Marcelo knows everything about the city and the falls. He answered every question with interesting answers. Marcelo D went above and beyond to be sure we had a incredible time at Iguazu Falls. Marcelo arranged wheel chairs for my Wife insuring she saw all there was to see on both the Brazilian and Argentinean side of Iguazu Falls. He is very knowledgeable about, the geology, animals, birds, insects, reptiles, and plants. We were very fortunate to have him guide us at Iguazu Falls. Marcelo was the ultimate tour guide! He was always prompt, professional,friendly and eager to share his vast knowledge of his country including plant, animal and bird life. Marcelo was attentive to our personal needs. He navigated customs for us with ease and efficiency. His attention to detail was unsurpassed! He even washed his car every night as part of his high standards. We spent 4 days with Marcelo and could not have asked for a better ambassador for Brazil and Argentina. Thanks for everything!! We really enjoyed our tour with Marcelo. He was very organized and knowledgeable with several aspects of the Falls including the wildlife. He was also very flexible with our schedule and pace, (we like to move fast). I would highly recommend a private tour with him. Marcelo is fabulous. his passion for his work shows in every aspect of the tour. Highly recommend!! Marcelo made our day! He is extremely knowledgeable about the history, flora & fauna, & culture of Argentina/ Brazil/ & Paraguay. He provides the little details that inform and delight the tourist that is there to learn what they can during the time of their visit. He was extraordinarily kind & patient when dealing with my elderly parents' and their physical limitations during our excursion to Iguazu Falls & the Itaipu Dam. I highly recommend Marcelo for all tours of the Iguazu region. Marcelo was a great tour guide. He picked us up on time from our hotel in a clean, comfortable car. He knew exactly what needed to be done to smooth out things that normally can prove very difficult for travelers, such as getting across borders and handling visas and foreign exchange. He was friendly, kind, polite, with a pleasant sense of humor. And very importantly for us, he knew his subject matter well. He could tell us not only about the places we visited but also about the flora, fauna, and history. TOUR GUIDE RESPONSE: Thank you very much Laura Black for your comments and your feedback. Going outdoor everyday is for me a healthier pleasure, environmental subjects are also important informations with can give a wider perspective for visitors. And are many other details that compose these visits in which persons like you and your nature sensibility are my major focus. Thank you very much for coming. Our tour with Marcelo was fantastic. Marcelo picked us up on the Brazilian side of the park before sunrise, then took us to a quiet road inside the Argentinian side of the park for sunrise birding. He attracted several new species for us with attracted calls. We found Marcelo to be personable, incredibly generous, widely knowledgable about local flora and fauna, and completely fluent in English. We would not hesitate to hire Marcelo again, and neither should you! Very knowledgeable guide, able to identify birds and give other inforation on plants, insects and animals. He tok us to an area of the national park that had a large number of species that we had not encountered before. We thoroughly enjoyed the tour and woul recommed Marcelo to amyone interested in this area of the Argentinian/Brazilian border. TOUR GUIDE RESPONSE: Hi Vidyasagar Premkumar, Thank you very much for your feedback! The weather which didn't cooperate for a better tour but anyway I was very proud to have had you as my clients. All the best for you all! Marcelo est un guide merveilleux parlant un très bon français. Il est passionné et connait très bien la région. Il est un guide très utile pour organiser la journée et plein de bon conseil.Vous pouvez partir les yeux fermés avec lui. Marcelo is an awesome guide - speaks several languages, and is so knowledgeable about plants and animals that we came across! He is friendly and funny, and was willing to be patient with two women in our 50's, as we tried to climb all the hills and keep up with him. I would definitely recommend him to anyone wanting an informative and fun tour of the Falls. We saw both sides in one day. TOUR GUIDE RESPONSE: Hi Sherri Cupples, Thank you very much for coming, for your comments and to give me a chance to be part of your day and learn with you too. All the best. We met Marcelo at the hotel on time. We were introduced to the driver. We went to the Iguazu Falls on the Argentina side, it was beautiful. He then took us to the Brazil side and it was more magnificent. Marcelo and his driver did a fantastic job, they were very accommodating, I can not explain what a fantastic job they did for us. What a wonderful experience we had with our guide Marcelo. He was exceptional in his work ethic and well educated. He was a fountain of knowledge and his love for his work showed. It was just a real pleasure to have him for a guide. If he said he was going to be there at a certain time, no worries, he was always there waiting. And a bonus was an extremely neat, clean and well groomed car. I will recommend him anytime. If you can give a score higher than 100% he will be the one to deserve it!